This exhibition, which surveys the most recent ten years production, confirms his standing as one of this country’s true virtuoso painters. Happily it coincides with his return with his family to live in Ireland. PTM: John, your paintings are very emblematic, surfaces and motifs, a constituency of fragments making up a whole. JNS: Well a noted Irish critic now retired once described the work as being made up of fragments and that’s not correct. It’s about the respective parts of the painting coalescing together. Its about a potential unity not a potential disorder. I think the work deals with aspects of reality rather than fragments of reality. An aspect intimates a will to wholeness, a fragment displays the opposite qualities. What you are observing is not the moment of disintegration rather the instance before cohesion. An aspect for me is like an apple, a unitary thing that contains the seeds of its own reproduction. PTM: Well good painting always references painting. JNS: That’s right, in a recent diptych entitled Madonna, Icon, Wormhole, I used my wife as a model. This has been likened to Gerhard Richter’s portrait of his daughter, which has some truth, but more essentially, from its design element it refers to a portrait by Holbein of Christine of Denmark. It’s a Madonna, but there is a hint of something more pagan, it relates also to the more fecund pre-Christian Venuses, something that did not appear again perhaps until the Renaissance. On the other hand, its nearly a Maesta – in this case instead of an infant, the mother holds a teddy-bear blanket. It must be remembered that it is a diptych, it is one panel in a two panel painting. The other panel comes from my recent series of paintings entitled Spiral which in turn revisits works which were done in 1978. I exhibited them in a solo exhibition in the Triskel in Cork in 1980 – they were the last paintings I did before leaving for Germany. PTM: Richter, that most famous of contemporary German painters, how does he figure for you? JNS: I admire his work a lot. He’s twenty years older than I and has probably lived under two totalitarian regimes. In the seventies Richter did not give much credence to the concept of painting as an idea. But in order to continue painting, he had to pretend not to be engaged in the activity at all. He developed his famous ‘Foto-Abmalung’ – it then followed that if his realist works were photos, then his abstract works were also photos, what he termed meta-paintings. The rest is history. PTM: But, in a way, don’t you share the notion that painting itself can become its own subject and, if that is so, the question is how do you paint a subject? JNS: Well, in the painting Five Spaces TSSST in the second panel where Monika stands in front of a Knot painting, there are about five different techniques applied in the laying down of the pigment in different areas, contrast the back of the neck to the towelling to the knots. But my objective is not merely to render the skin, but to control the paint surface. In order to achieve a larger understanding of form and space, an analysis of surface is necessary. From an artist’s facility to observe the minute, he achieves a better expression of the whole. This makes it incredibly abstract irrespective of what illusion it may or may not be intended to create. Artists are always thinking like that even with historical work when illusion or how real you could make it look was some sort of agreed measure: the most successful artists had a great sense of how to design their works. The abstract quality is distinguished by this sense of design. That’s when we see followers of certain artists, though they may have the technical abilities, their design sense over elaborates the structure of the paint and the painting. Skill is not a simple thing, it can be improved on with practice but it is a given, a personal distinguishing attribute. You can compare modern poster design to Giotto and Giotto will win every time for exquisiteness of its design. 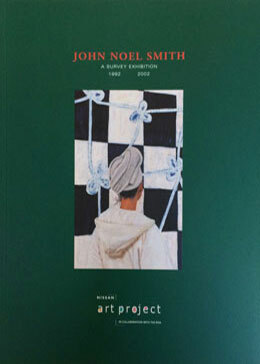 John Noel Smith – A Survey Exhibition 1992-2002. Dublin: The Royal Hibernian Academy, 2002.